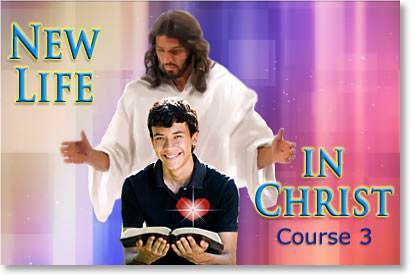 In our last lesson we learned how to lead others to Christ. Soul-winning is thrilling work, but it brings us into direct conflict with Satan and the powers of darkness. Every soul won to Christ is a soul snatched out of the hand of Satan. This will cause Satan to war against us. We will never understand what the Christian life is all about until we see that it involves spiritual warfare. Two kingdoms are at war—God's kingdom and Satan's kingdom. The battle is for the souls of men! Do we have a part in this warfare? Yes, we do. Our part is to be soldiers that God can use in the battle against Satan. We must pray! We simply cannot live the Christian life without prayer. It is through prayer that we commune with God; it is through prayer that we obtain the things we need; it is through prayer that we intercede for others; and it is through prayer that we bind the power of Satan. 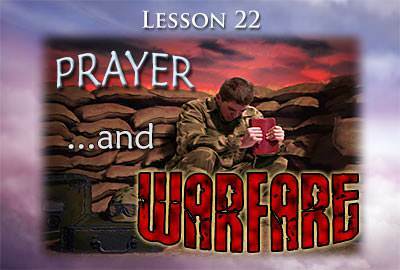 In this lesson we are going to see how God uses our prayers in the battle against Satan, but first, let us consider some important things about prayer. Prayer is talking with God. Prayer is not a ritual or a public performance—it is a personal matter between you and God. The Lord Jesus said, "When you pray, enter into your closet, and when you have shut the door, pray to your Father in secret." The Lord Jesus told us not to use "vain repetitions"—saying the same things over and over. Our prayers must be sincere and from the heart. Can everyone pray to God as Father? No, only those who are in God's family can call Him "Father." There is only one prayer that God will hear from an unsaved person—the prayer asking for forgiveness. God always hears this prayer from an unsaved person. 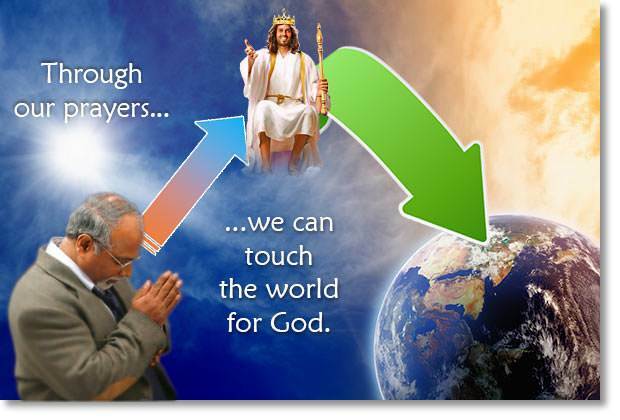 The Lord Jesus is our great Intercessor in Heaven. We pray to the Father in His name. It is because of who Jesus is and what He has done that God hears and answers our prayers. In this verse, the Lord tells us plainly that His doing depends upon our asking. Prayer is not just asking God for things. There are three main forms of prayer: (1) communion, (2) petition, and (3) intercession. Let us consider these. This is fellowship with God. 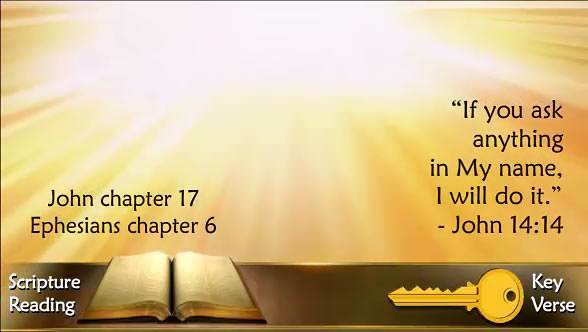 We read God's Word so that He can speak to us; then we go to Him in prayer. We worship Him, we adore Him, we praise Him, we thank Him for His blessings, we tell Him how much we love Him. "the people that do know their God shall be strong and do exploits." This is asking God for what we need. We need many things. We need strength to overcome temptation. We need wisdom. We need power to serve God effectively. We need guidance in making decisions. We need food, clothes, and other necessities. We must pray in the will of God. If we ask God for something that is not in accord with His will, He will not give it to us. We should be very grateful for this, because we do not always know what is best for us. A little boy might ask his father for a razor or a sharp knife, but the father loves his child and he knows that this would bring suffering to him, so he does not grant his child's request. 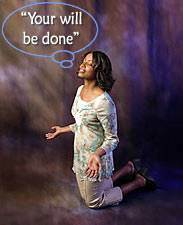 The greatest prayer we can pray to God is, "Your will be done." This shows that we are trusting God's love and His wisdom. 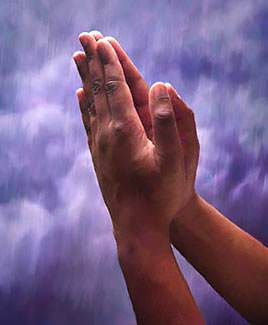 We can ask for the things we want, but in all of our prayers we should pray, "Your will be done." We must be "on praying ground." When our prayers are not answered, we should ask ourselves, "Is there anything in my life that is hindering God from answering my prayers?" 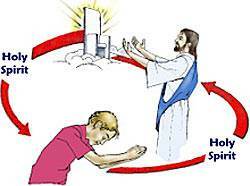 The great hindrances to prayer are: (1) sin, (2) selfishness, (3) unforgiveness, and (4) unbelief. These things give Satan a foothold in our life, and God will not hear our prayers. This is prayer for others. Communion and petition are mainly for our needs, but intercession reaches out to help others. We pray for our unsaved friends and relatives; we pray for those who preach the gospel; we pray for our leaders; we pray for those who are sick. This form of prayer helps God in His great love-plan to bring men back to Himself. One form of intercession is prayer warfare. This is prayer against Satan. When we have learned how to keep in touch with God through prayer and the reading of His Word, then God can use us in the battle against Satan. Now let's review some facts concerning the warfare between God and Satan. Second, God gave the rulership of this earth to man. God gave Adam dominion over all the earth. Third, Adam rebelled against God. He took sides with Satan and came under the power of Satan. Thus Adam lost the rulership of the world, and Satan took it over. It was through sin that Satan gained control of the world. Fourth, God wanted to bring this world back to Himself, and He wanted to do it through a man. So God sent His Son, the Lord Jesus Christ, into the world as His second Man. 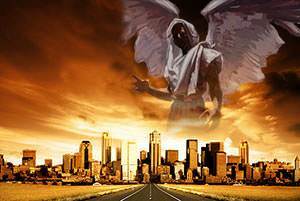 Fifth, a great battle raged between Satan and the Lord Jesus, God's second Man. 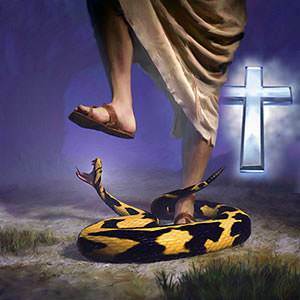 The Lord Jesus was tempted as no man was ever tempted, but He was victorious over all the temptations of Satan. Finally, in desperation, Satan stirred up people to crucify Jesus. The Lord Jesus was given all authority in heaven and in earth. Satan and his forces of darkness were stripped of their authority. 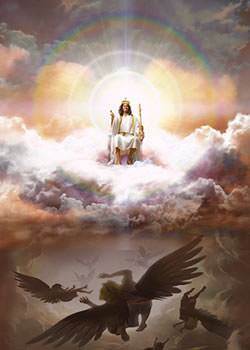 The Lord Jesus ascended back into Heaven, where He is seated at the right hand of the Father "far above all principality, and power, and might, and dominion." The great thing to remember in our warfare with Satan is this: SATAN IS DEFEATED! We don't have to defeat Satan—Christ has already defeated him at Calvary. As God's servants, you and I are to proclaim the gospel to the unsaved and to deliver them from Satan's power. 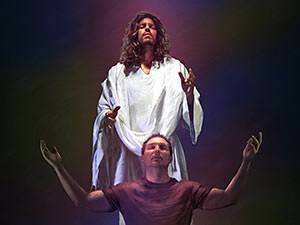 The Lord Jesus said that, if you want to take goods from the house of a strong man, you must first bind the strong man. Satan is "the strong man," and his "goods" are the people he holds in his power. If we are to deliver people from Satan's power, we must first "bind" his power. How do we "bind" Satan's power? We bind Satan's power by claiming Christ's victory of Calvary. Now we come to a very important question: How do we make Christ's victory our victory? We make His victory our victory by CLAIMING IT! Christ paid for your sins on the cross, but you were not saved until you claimed it. Just so, you must claim Christ's victory over Satan. You can do this by praying: "All that Calvary means, Lord! All the mighty victory of Calvary!" When you pray this prayer, you are saying, "Lord, I can't deal with this situation, but You can. You are victorious over all the power of Satan, and I am claiming Your victory in this matter." As we claim the victory of Calvary, Christ binds the power of Satan. God has given you a mighty weapon to use against Satan, but a weapon is no good unless you use it. So claim the victory of Calvary. Suppose Satan attacks your home. There are hard words and bitter feelings. What should you do? Claim the victory of Calvary! Christ says to you, "Bind the strong man, Satan, in My name." How do we deal with the powers of darkness? We deal with them by claiming Christ's victory of Calvary. "All the mighty power of Calvary. Victory in Jesus' name." Pray about problems in your home and in your church. Pray for Christians. Pray for your unsaved friends and relatives. Pray for those who are preaching the gospel. Pray in Jesus' name. Pray earnestly. Pray believingly. Pray in the victory of Calvary. The winning quality in prayer is persistence. This means DON'T GIVE UP. Keep praying until the answer comes. It takes time for God to deal with human wills. It takes time to change situations. God wants us to hold on in prayer, claiming the victory of Calvary. 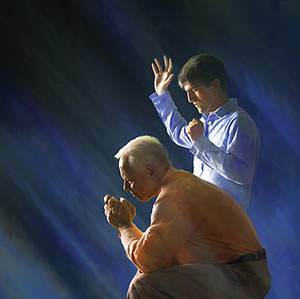 The Lord Jesus said, "Men should always pray, and not faint."